Yesterday was budget day, and you will be pleased to know that here in the NZADDs admin division we’ve taken time out from our hectic schedule of log-frames and high level meetings to provide you with some budget analysis. It is preliminary, done quickly, and somewhat provisional. We’re still hoping to get proper GNI figures from Treasury for example. To read this email properly you will need to click ‘show images’ in your email browser. Or you can read it as a pdf here. If you’re looking for a handy way of putting the New Zealand aid budget into perspective here’s a thought. The increase in Australia’s aid next financial year is going to be larger than the entire New Zealand aid Budget. As a percentage of GNI New Zealand aid is still higher than it was for most of the 1990s and the first half of the last decade. And the government does deserve credit for at least coming close to maintaining the ratio. But looking at Australia’s efforts (see the rising black line in the last chart in this post) it’s clear that New Zealand could be doing better. It’s true the New Zealand economy is sluggish and the country is running deficits, but deficits are also present in Australia, our aid spend is small compared to total government spending, and the fiscal forecast is improving. A careful read of the budget numbers hints at other causes for concern too. Figure 2, charts aid budget data in non-inflation adjusted New Zealand dollars. 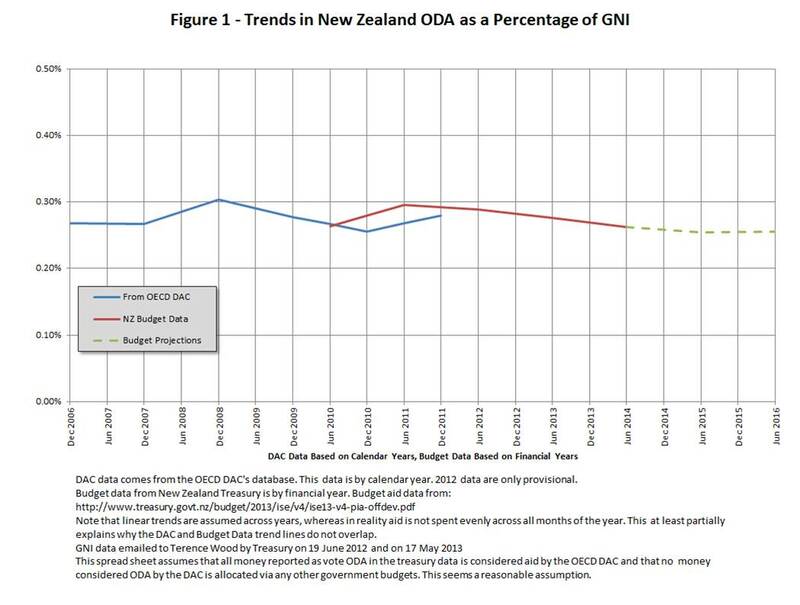 In its first term, when it abandoned the global ODA as a percentage of GNI metric, the National Government offered as an alternative target $600 million NZD by 2010. This is a target that has never been met. Indeed, as Figure 2 shows it is now only projected to be met in the 2015/16 financial year, and when one considers the increase in ODA required for this to happen, in contrast with the almost entire absence in increases in preceding years, even this looks unlikely. Figure 2 also illustrates the projected amounts from last year’s budget, these are the red boxes (while the blue bars are the 2013 budget). As you can see in the 2011/12 financial year the aid programme ended up spending approximately $32 million dollars less than anticipated. This is a big underspend, and the good news, we guess, is that it has been rolled forward into the new three year budget allocation. The bad news is that effectively it is the source of almost the entire growth in New Zealand aid over the next two years. The underspend also begs the question, how did the aid programme end up so far underspent? This isn’t the first time this has occurred, although it wasn’t a problem the aid programme routinely had prior to 2008. It is something that is arisen since the change of government. The most likely explanation, we think, is the Minister’s reluctance to sign off on the aid programme’s high level allocations (agreement on the share of the annual aid budget different countries or regions will receive). One year, while one of your humble NZADDs grunts (Terence) was working for the aid programme, it was not until close to the middle of the financial year that sign off was granted. Needless to say, it is very hard for the aid programme to fully spend in a financial year if it doesn’t know how much it is allowed to spend in particular countries. Curious as to whether this was still an issue in 2011 another member of the NZADDs team (Jo) sent an Official Information Act request to the Minister’s office regarding sign-off dates. His reply was that there was no such thing as sign off dates. This, to put it kindly, is rather implausible. So Jo appealed his reply to the New Zealand Ombudsman’s office, and is awaiting a ruling. As a New Zealander it doesn’t pay to stare enviously over the Tasman too often but, once again, it’s hard not to notice that while Australian budget documents afford detailed data that allows considerable aid analysis (see the recent posts on www.devpolicy.org), in New Zealand these days we get little more than the headline figure. We can see allocation to overheads and the multi-lateral versus bilateral split, but that is about all. Nothing, for example, at the country level (although a little bit at a regional level). Fortunately, the aid programme itself is still doing a good job trying to be transparent, and greater detail on spending is available in the International Development Group’s Strategic Plan 2012-2015 or on the New Zealand ODA website, and excellent work has been done with IATI data. This is great. But it all happens later in the year or after the fact, and it is not the same as getting detail on budget day. Also in terms of process and accountability there’s an important issue in that that the budget is the only document that undergoes parliamentary scrutiny. Information in aid programme documents or the website are not interrogated in the same way via our political system. This provides space for juggling in between budgets, such as appears to have occurred last year, after the budget passed through parliament, with the probable cutting of funds to various country programmes to make way for the newly invented ‘Pacific Transformation Projects’. Here in the NZADDs admin division we’re still New Zealand taxpayers, and doubtless the Minister appreciates our efforts to hold him to account. But when we look at the data provided by the Australian government this budget and contrast it with the paucity of information on our side of the Tasman it’s hard not to feel that someone truly serious about being held accountable would be releasing more. Likewise, looking at the tiny increases in New Zealand aid, and comparing it to what the Australian’s have done, it’s hard not to feel that if we Kiwis were really serious about doing our bit in helping to fight global poverty we would be giving considerably more aid. In other aid news you all will have heard of the recently completed aid and renewable energy summit in Auckland. Pulling this together was a remarkable undertaking and all involved deserve credit for the, um, energy, that went into it. We still have some concerns, which we outlined in a recent Dev Policy blog post. Also, there is an interesting interview with Helen Clark (regarding the UNDP) on the ABC’s website, which you can access here. And prolific American academic development blogger Chris Blattman has a fascinating post linking to some evidence on what works in the economic empowerment of women.